A belter of an opening day to the Dublin Racing Festival. Here is your report to each Saturday's three big races from Daragh Ó Conchúir as well as a summary of the rest of them. Apple’s Jade has routed a high-class field to become the first mare in 16 years to win the BHP Insurance Irish Champion Hurdle. It was a scintillating performance by the seven-year-old, who in emulating Like A Butterfly, was garnering a 10th Grade One and in the process, bringing her career earnings to in excess of €700,000. What was remarkable about the triumph, quite apart from the effortless manner in which she pulled 16 lengths clear of last year’s victor Supasundae, was that it was her third Grade One success of the season, attained over three different trips. 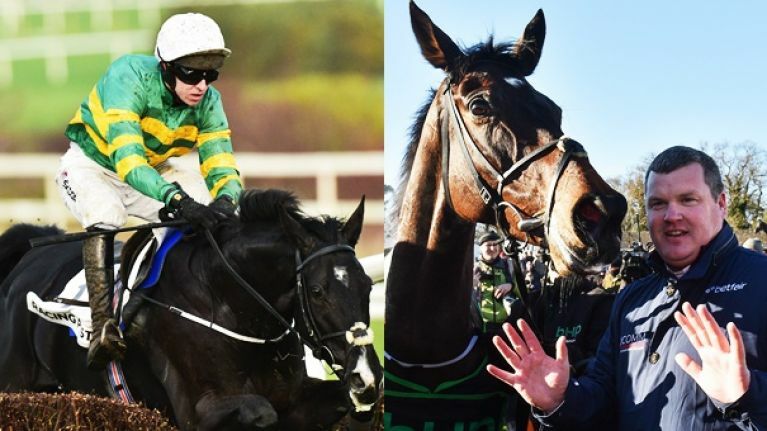 With her Hatton’s Grace and Christmas Hurdle successes coming over two and a half and three miles respectively, this one over two miles now raises the possibility of Apple’s Jade taking a shot at the Champion Hurdle at Cheltenham in March, for which she earned a quote from Paddy Power of 7/4. She is also hotly-fancied for the Mares’ Hurdle, which she won in 2017, and the Stayers’ Hurdle but for now, trainer Gordon Elliot, who like jockey Jack Kennedy and owner Gigginstown House Stud was two-out-of-two for the day after Commander Of Fleet’s opening Grade One victory of the day, is anxious to enjoy the occasion. “We’ll get her home and we’ll discuss it with the owners” said Elliott. “She’s entered and we won’t rule anything out. She’s in the Champion Hurdle, she’s in the Mares’ Hurdle and she’s in the Stayers’ Hurdle. She could run in any of them." This was after Eddie O'Leary was a lot more assured as to where their star would go. After watching Gordon Elliott record a treble, comprising two Grade Ones and a Grade Two contest, champion trainer Willie Mullins opened his account when Min effortlessly took the spoils in the day’s third Grade One race, the Ladbrokes Dublin Chase. In an incident-packed affair, Henry de Bromhead’s brilliant former Champion chase winner, Special Tiara sadly suffered a fatal injury before the field had even reached the first fence, where the Pat Fahy-trained Castlegrace Paddy fell. Winning jockey, Ruby Walsh reported that the latter event might have spooked the winner but he had the long-time leader, overseas challenger Saint Calvados well in his sights jumping the last, before easing away to win at the prohibitive odds of 4/9. Ordinary World ran a big race for de Bromhead to take second, six lengths back. “I think he got a fright when Castlegrace Paddy fell and didn’t jump well for the next few fences” said Mullins. Mark Walsh and JP McManus teamed up successfully for the second time on the opening day of the Dublin Racing Festival at Leopardstown, when Le Richebourg ran out a seven-length winner over Us And Them in the day’s fourth and final Grade One contest, the Frank Ward Solicitors Arkle Novice Chase. 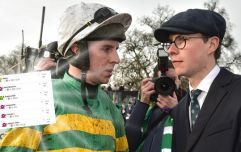 The jockey and owner had been victorious earlier in the Ladbrokes Hurdle with the Charles Byrnes-trained Off You Go and combined on this occasion with Joseph O’Brien, who was also responsible for the runner-up. Le Richebourg appeared to be outstayed by Delta Work when beaten in the Drinmore Chase at Fairyhouse at the beginning of December but impressed when proving too strong for Us And Them in Grade One company over two miles at this venue during the Christmas festival and confirmed his relish for the shorter trip today. “He jumped well on the whole and when he had to be clever he was” said O’Brien. “Mark gave him a lovely ride and he was very cool on him. “He made a little mistake at the last here at Christmas and it was good to see him learn from that. The first of Dublin Racing Festival’s eight Grade Ones at Leopardstown went to Gordon Elliott, Jack Kennedy and Gigginstown House Stud, after Commander Of Fleet got the better of a protracted battle up the full length of the straight with the Joseph O’Brien-trained, Mark Walsh-ridden and JP McManus-owned Rhinestone to claim the Nathaniel Lacy & Partners Solicitors ‘€50,000 Cheltenham Bonus For Stable Staff’ Novice Hurdle. Charles Byrnes won the third race of the day with the JP McManus owned Off You Go who obliged at 8/1. The highly rated Envoi Allen won the next for Gordon Elliott at odds of 6/4. Meanwhile, Quamino landed the last race of the day at 14/1 for Paul Nolan and Bryan Cooper.